Flooding and water damage can occur in the blink of an eye. If you have water rising fast in your home or just walked into a flood emergency at your business, you’ve found the right contractor. 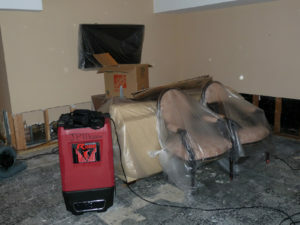 We are experts with 25 years of experience in flood cleanup and restoration. Call us before you call your insurance company, we will deal with them directly. Our emergency crews are available 24/7 and will arrive at your home or business within 60 minutes to start the water extraction. We immediately get the flood under control and start pumping and extracting the water from your flooded property. We have a large inventory of generators, pumps, and drying machines at our disposal. Our fully-equipped staff pumps and extracts the flood. Once the water has been extracted from your home, we remove damaged building materials, carpeting, and furniture. All materials and furniture damaged by the flood will be removed. This includes any flooring, walls, insulation, ceilings, and other structures as they may contain mold, lead paint, or asbestos and can harm your family. Once everything is clear, our crew goes to work drying the structure with industrial strength drying machines. These machines continue until every room has been dried out thoroughly and passes all testing for moisture and humidity. As a licensed building contractor, we use our craftsmanship and skills to rebuild your walls and flooring to their original condition or better. Flood emergencies can be very stressful and frightening and we want to make it as easy for you as possible. When you are faced with a water emergency and seek fast services, you can count on us to show up within an hour to get started. We will get the job done quickly and completely. Call us now at (877) 645-1428 for our emergency services.